DC’s Justice League books are the best they’ve been in years right now, largely by shifting focus to the character dynamics within superhero teams. Christopher Priest and Pete Woods’ Justice League is off to a riveting start, and Steve Orlando’s Justice League Of America is at its best when it shows how different superhero personalities clash and/or complement each other. The most recent JLA arc pitting the heroes against Prometheus was Orlando’s strongest story yet, exposing each member’s vulnerabilities while reinforcing that this is a group that relies on the non-powered public for support. 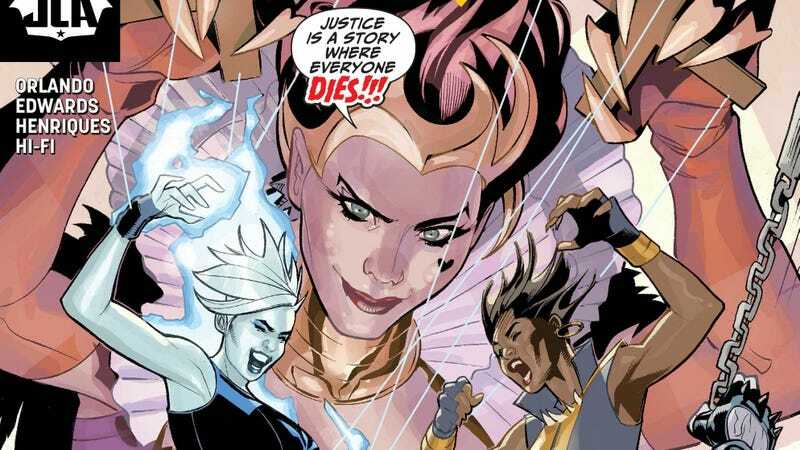 The team is currently splintered, leaving characters like Killer Frost vulnerable to manipulation, especially when it comes in the form of an impossible wish magically granted. Orlando is dedicated to bringing back forgotten figures from the League’s past in this title—last issue featured the return of Aztek, specifically the female iteration who appeared in Grant Morrison’s “Rock Of Ages” epic—and this new storyline reveals the identity of the mysterious “Might Behind The Mirror” that has been pulling the strings over the past year: The Queen Of Fables. This old foe of the League hasn’t been seen since before the New 52, and Orlando has made her a villain for bleak modern times, offering instant solutions to people’s growing problems. Of course, these have unforeseen consequences down the line, and the JLA has been tasked with fixing the fallout. The team has now been compromised by Killer Frost, who accepts a cure to her heat sickness in this exclusive preview of Justice League Of America #22. Already frightened by her powers, she succumbs to the Queen of Fables when she’s shown an apocalyptic vision of a future where her thirst for heat has destroyed mankind. Artist Neil Edwards, inker Daniel Henriques, and colorist Hi-Fi capture Caitlin Snow’s growing terror as she’s overwhelmed by the prophecy, which is presented as a giant wall of ice that threatens to crush her on the page. Orlando has spent the last year showing Caitlin’s emotional instability, and the Queen takes advantage of that to continue shattering the only group that stands in her way. She’s about to make her presence known, and the JLA is going to have to figure out some new solutions fast if it wants to make it through its first year.